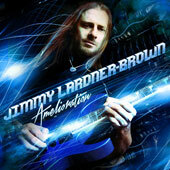 'Amelioration' is the debut solo instrumental album from Australian metal/rock guitarist Jimmy Lardner-Brown. It features a diverse collection of melodic instrumental guitar songs ranging from tender ballads to brutal thrash. I'm pleased to announce that I've joined Sydney death metal band Deiformity on lead guitar. Looking forward to getting back to my roots and shredding some brutal death metal! Two of my past Australian Guitar Magazine columns have been uploaded to the site (AG129 and AG139). These are: 'Mixing It Up' (the Mixolydian mode) and 'Step-By-Step Shredding' (chromatic licks). Check them out here. Vaticide was a thrash/death metal band from Sydney, Australia that was active from 2001-2007. A full length album was recorded in 2004/2005; unfortunately, it was never released. This is a compilation of my solos from the unreleased album. I've always liked this song. It was written in 2007 for my girlfreind at the time – it even had lyrics to go along with the melodies. My 'Shredded Metal' columns from Australian Guitar Magazine issues 127 and 128 have been uploaded – titled 'Slip 'n Slide' and 'Power Chords and Dyads' respectively. My columns from Australian Guitar issues 123, 124, 125, and 126 have been uploaded. Check them out in the Columns section of the site. 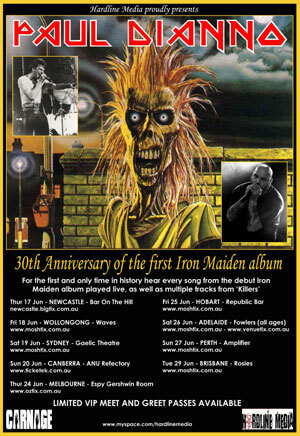 Darker Half will be doing a special all Iron Maiden set at the 'Giants of Metal' show on 16 March 2018 at the Basement, Canberra. We'll be playing Maiden classics such as 'The Trooper', 'The Number of the Beast', 'Run to the Hills, 'Wasted Years', and more! 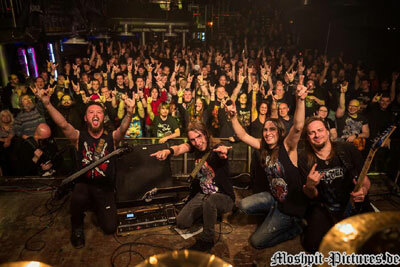 The Rage/Firewind/Darker Half European tour was amazing! 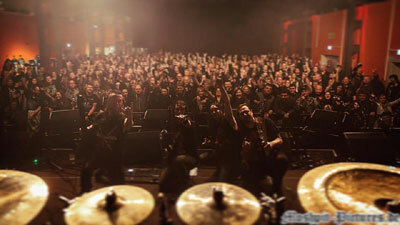 Massive thanks to Rage, Firewind, all the crew, and Lucky Bob Management. Two of my recent Australian Guitar Magazine columns have been uploaded. In AG#121, I transcribed my solo from the Dark Half song 'The Deal' and teach how to play it. In AG#122, I explain the difference between the four basic triads in music. Check them out here. Upcoming Darker Half shows include Stimata Promotion's 15th anniversay on November 25, and a gig at the Factory Theatre on December 8. My AG columns from #119 (bending) and #120 (tapping) have been uploaded. Check them out here. My columns from Australian Guitar Magazine 117 & 118 have been uploaded to the Columns section of the website. In these two, I look at the Darker Half song 'Genesis/Genocide' to discuss using the Lydian mode in a metal context, as well as how to compose shred-style twin guitar harmonies. 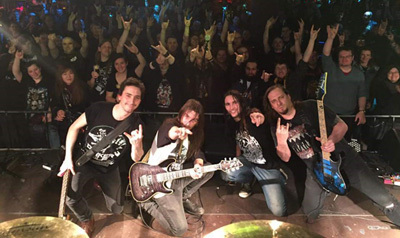 Darker Half's European tour with Rage was a huge success! It was an honour supporting such an amazing and legendary band! I want to send a big thanks to Rage - Peavy, Marcos & Lucky - for having us on the tour and for delivering a killer show every night. I also want to thank Rage's crew - Charlie, Lisa, Flo, Dino & Dominik - for all their help and hard work. 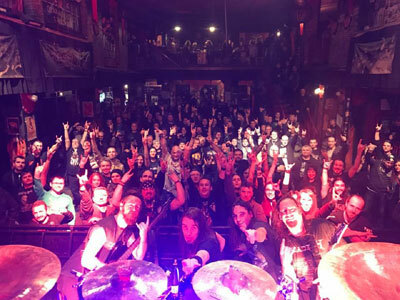 Thanks as well to the other great bands on the tour; Monument (UK) and Messiah's Kiss (US) - it was a pleasure playing with you guys. Finally, I want to thank Lucky Bob Management for getting Darker Half on the bill. It was awesome! I'm pleased to announce that I will be touring Europe with Darker Half in Nov/Dec supporting German metal legends Rage! The September/October issue of Australian Guitar Magazine is out now! In my regular column, I take a look at a solo from my original song 'Genesis/Genocide', taken from Darker Half's new EP 'Classified'. Using this track as an example, I discuss how you can use the Lydian mode in a heavy metal context. The mag is available at all good newsagents across Australia. Check it out! 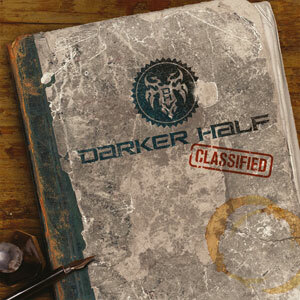 DARKER HALF 'CLASSIFIED' EP - AVAILABLE NOW! Darker Half's new EP titled 'Classified' is now available to purchase online. This is my first recording with the band and I'm very pleased with how it turned out. I laid down some cool solos, and the EP also features the song 'Genesis/Genocide' where I wrote the music and lyrics. Buy it now on iTunes, or go to the Darker Half Store for the physical CD. 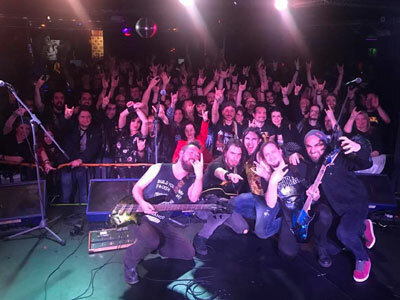 Darker Half's tour of Eastern Europe was awesome! We played some great shows and met some great people and bands! 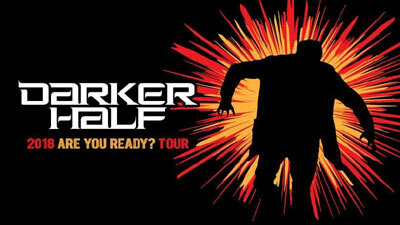 Darker Half have a slew of shows coming up over the next few months including gigs in Sydney, Melbourne, Brisbane, New Zealand, and Europe. The column for AG #111 has been uploaded - 'Shredding through the Changes'. In this article, I explain how to solo over the opening chord progression of the classic Steve Vai track ‘Taurus Bulba’ (involving the E Phrigian dominant, D Lydian, and C Lydian modes). I'm pleased to announce that I'm now an official member of the Sydney power metal band Darker Half! I'm pleased to share another song from my debut instrumental solo album 'Amelioration'. The track is called 'Initiation... Addiction' and it's one of the heaviest on the CD. There are some crazy solos and it features absolutely incredible drumming from Luke Cook (Mortal Sin, Vaticide, Killrazer). Mixed and mastered by Darren 'Jenk' Jenkins. Also, I've uploaded a clip of me from a few years ago jamming to Steve Vai's classic track 'Taurus Bulba'. This was from when I was recording a vid for the Jam with Steve Vai Competition. Check it out HERE. I'll have copies of my debut solo album 'Amelioration' available at all the shows. My column from Australian Guitar #107 has been uploaded - 'Singing While You Solo'. I'm pleased to share the song 'Ripples' from my forthcoming solo guitar album. The track features Dom Simpson (Darker Half) on drums, and it was mixed and mastered by Darren 'Jenk' Jenkins. The song is about surfing and being alone in the ocean. DEBUT SOLO ALBUM 'AMELIORATION' - SINGLE OUT NOW! I'm pleased to share the first song from my debut solo instrumental album 'Amelioration'. This is the title track. It features Luke Cook (Mortal Sin) on drums, and it was mixed and mastered by Darren Jenkins at Jenk Productions. The CD will be available very soon. LAZERHAWK - 'THE ORIGIN OF POWER' - OUT NOW! I played solos on this killer debut album from Sydney metal band Lazerhawk. "Featuring ex-Norse Metal founder and chainsaw operator Simon Stavresvski laying down insanely fast and equally precise rhythm and melodies, Killrazer's own Jimmy Lardner Brown laying down some of the most insane solo's you will ever hear, and ex Daemon Foetal Harvest Drummer Paul Ibbotson switching to vocals for the first time and laying down extreme high octave screams of power while also still writing all the drums! Lazerhawk: Supersonic Hyper-Ballads For Absolute Legends!!" 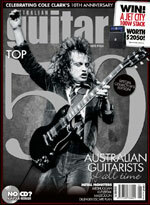 The columns for Australian Guitar Magazine issues #104, #105, and #106 have been uploaded to the Columns section. My column for Australian Guitar #103 has been uploaded - 'Mixing Minor Modes'. Two of my recent Australian Guitar Magazine columns have been uploaded to the site - 'Opening It Up' and 'Soloing in Odd Meters'. 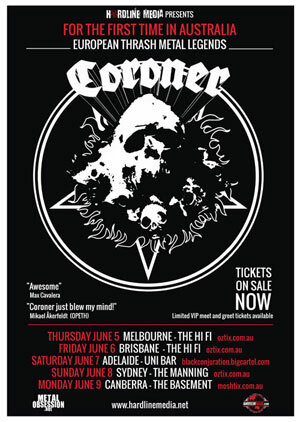 Also, Killrazer will be the main support band for European thrash legends Coroner on the Melbourne, Brisbane, Sydney and Canberra legs of their upcoming Australian tour. My 'Shredded Metal' column for the big 100th issue of Australian Guitar Magazine has been uploaded and can be viewed here - 'Putting it All Together'. More videos from my final Bachelor of Music graduating recital at the Australian Institute of Music have been uploaded including the Michael Angelo Batio classic 'No Boundaries' below. These full clips from my recital (including covers of Steve Vai, Megadeth, Steely Dan, Kylie Minogue, etc) can be found in the Live Videos section of this site or on my YouTube Channel. The column for issue #99 of Australian Guitar Magazine has been added - 'Getting Some Blues Under Your Bullet Belt'. In this article I talk about the importance of learning the blues. This video is a compilation of highlights from my final Bachelor of Music graduation recital at the Australian Institute of Music on the 28th of August 2013. I performed songs by Steely Dan, Chopin, Michael Angelo Batio, Kylie Minogue, Megadeth, Steve Vai and more. I think it went pretty well. The column from the last issue of Australian Guitar Magazine has been uploaded: Issue #98 - 'Half-Whole Diminished Delerium'. In this article I talk about the half-whole diminished scale and how it can be applied to heavy metal. On Wednesday the 28th of August at 9pm, I will be presenting my final graduation recital for the Bachelor of Music Degree that I have been studying at the Australian Institute of Music. I'll be playing songs by Steve Vai, Megadeth, Michael Angelo Batio, Steely Dan and more. It's free entry and open to public at the Tom Mann Theatre on Chalmers St near Central Station, Sydney. The evening kicks off at 6pm, and I'll be on at 9pm sharp. Two new Australian Guitar Magazine columns have been uploaded: 'Holier Than Thou!' ( the Whole Tone Scale) and 'Arpeggio Madness' (sweep-picking arpeggio shapes). The column from Australian Guitar Magazine issue #95 has been uploaded: 'Outside Inspiration'. This article talks about using other instruments as a source of new musical ideas on the guitar, with a look at my interpretation of a Chopin piano piece. A whopping three new 'Shredded Metal' technique columns have been uploaded (Australian Guitar #92, #93 and #94). Check them out here. The Paul Di'Anno/Blaze Bayley (ex-Iron Maiden singers) tour was awesome! Paul and Blaze are really cool guys and it was a pleasure playing guitar for two legendary singers from one of the biggest metal bands of all time! Here's a clip of them both singing 'Iron Maiden' in Auckland, New Zealand - the last song from the last show of the tour! 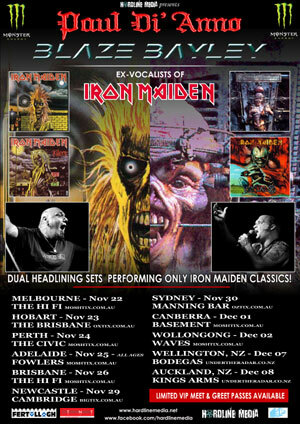 I'm very pleased to announce that I'll be playing guitar for ex-Iron Maiden vocalists Paul Di'Anno and Blaze Bayley on their upcoming Australian/New Zealand tour. This will be my third tour with Paul and first with Blaze. Both will only be performing Iron Maiden classics. It's going to rock! Videos from the Tim 'Ripper' Owens tour have been added to the Live Vids section of the site including the following clip of the classic Yngwie Malmsteen song 'Rising Force'!!! Australian Guitar Magazine Columns for issue #90 ('Shredding on One String') and #91 ('Augmented Arpeggios') have been uploaded. The RipperOPens tour went great! I have to give a big thanks to the other guys in the band - Doug Dalton (guitar), Dom Simpson (drums), and Vo Simpson (bass). Of course, an extra big thanks goes out to the man himself - Tim 'Ripper' Owens. What a voice! It was an honour sharing the stage with a metal legend! I did an interview with Australian Guitar Magazine to promote the Tim 'Ripper' Owens solo tour. It can be viewed here. I am very pleased to announce that I'll be playing lead guitar for the amazing Tim 'Ripper' Owens (Judas Priest, Yngwie Malmsteen, Iced Earth, Dio Disciples, Beyond Fear) on his upcoming Australian and New Zealand solo tour in May/June. Ripper will be performing Judas Priest classics, along with tracks from Dio, Yngwie Malmsteen, Iced Earth, plus his own solo projects. This will awesome! Columns from Australian Guitar Magazine #88 and #89 have been uploaded - 'Double Trouble: Part One' and 'Double Trouble: Part Two'. Both articles deal with the topic of twin guitar harmonies. The columns for Australian Guitar Magazine issues #86 ('Breaking Out of the Box') and #87 ('Legato Licks') have been uploaded. Check them out: Columns. 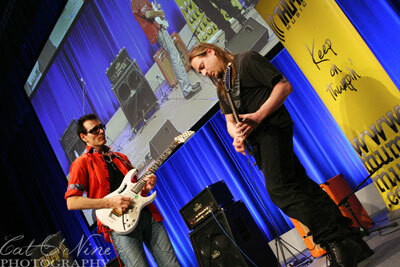 I was privileged to have the opportunity of jamming with Steve Vai at his recent Sydney Masterclass Clinic. Steve is my all-time favourite guitarist, composer and performer, so being able to share the stage him was a real honour! It was an amazing experience - one that I'll never forget! 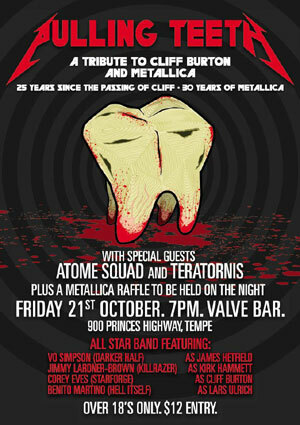 On Fri 21st October at The Valve Bar, Tempe, I'll be playing a two hour set of Metallica classics taken from the first three albums. This is a tribute gig marking the 25th anniversary of Cliff Burton's passing. The band - dubbed 'Pulling Teeth' - will also feature member's of 'Darker Half' and 'Starforge'. Should be a great night! The Shredded Metal column for Aus Guitar Mag #84 - along with the tab and audio examples - has been uploaded: 'Seventh Arpeggios'. 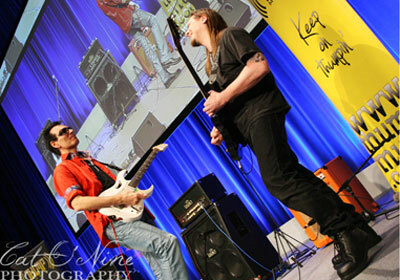 The column for Aus Guitar Mag #83 has been uploaded - 'Metal Soloing and Exotic Scales Part Two'. The 'Shredded Metal' column from Australian Guitar #82 has been uploaded - 'Metal Soloing and Exotic Scales Part One'. Shredded Metal column from Australian Guitar issue #80 uploaded - 'Four Finger Licks'. Column for Australian Guitar issue #79 added - 'Sweep Picking 101'. 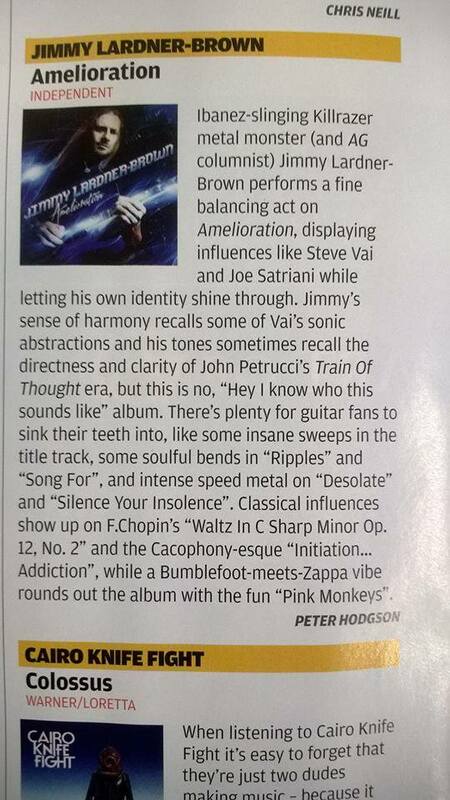 Column for Australian Guitar issue #78 added - 'Gaining Speed'. Column for Australian Guitar issue #77 added - 'Shredding All Over The Neck'. New video added to Live Vids section - Killrazer at Screamfest 2009, Enmore Theatre. 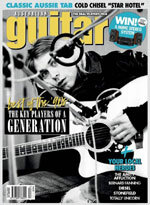 Column for Australian Guitar issue #76 added - 'Tapping Across the Strings'. The column for Australian Guitar issue #75 on the Phrigian dominant scale has been added to the Columns section of the site. Also, I ended up winning 'Best Guitarist' at the recent Australian Metal Awards. Column for Australian Guitar issue #74 - Symmetrical Licks - added to Columns section. I've been named as a finalist in the 'Best Guitarist' category at the Australian Metal Awards, to be held at The Forum, Sydney on November 7th 2009. The website is now online. It will mainly serve as an archive of my technique columns and instructional videos from Australian Guitar Magazine in the hope that the information will be useful for those interested in shred and metal guitar playing. Cheers.